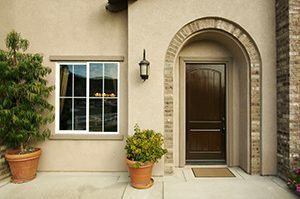 A door replacement can be a wonderful way to boost the curb appeal of your home, not to mention improve the overall energy efficiency of your residence. After all, if the front door on your home in Crestview, Florida, is outdated, it probably doesn’t have valuable energy-efficient features to keep your home sealed from the outside elements. A new front door from Majors Home Improvement, a leading door installer in the area, can be exactly what your home needs. What’s more, at Majors, we ensure a top-notch installation for every customer we serve by only employing factory-trained technicians who are dedicated to performing at a high level. They will be respectful when working in your home and work hard to cause minimal disruption to your day-to-day life. There’s no reason to take on a door replacement alone; instead, Let Majors Do It. Contact Majors Home Improvement today to schedule a complimentary consultation with our helpful design consultants at your home in Crestview, FL.